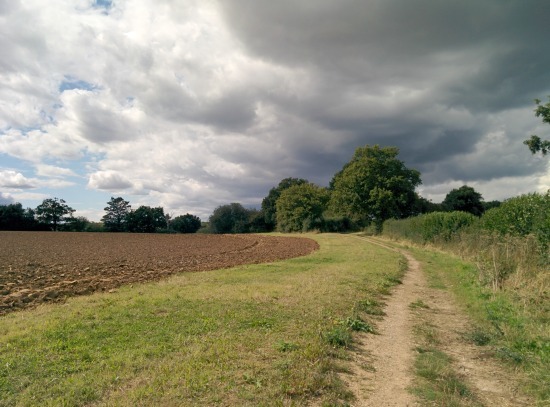 A pleasant circular walk through woodland, over open fields and down quiet footpaths through deep hedgerows. Park in the access lane that runs parallel to Swanland Road, and cross Swanland Road (with care - it's like a race track at times). Head for the footbridge over the A1(M). Cross the footbridge. After crossing the footbridge, turn right and follow the path as it heads north alongside the motorway. Continue along this path as it bends round to the left and then the right. Continue walking north-west, passed a footpath heading off to the right (there should be a small wooden bench here if you need a rest), and continue until you reach a footpath/track on your left. Turn left and head south-west down a footpath with fields on your left and right. Soon you will come to Cangsley Grove woods on your right. Continue along this track as it widens and you reach a field on your left. Keep going straight along the path for a short distance with the field on your left and Cangsley Grove on your right until you reach a gate on your left opening into the field. Here you enter the field and cross it diagonally heading south-west. Aim for a small footbridge at the bottom of the hill. Cross the bridge (a plank, really) and continue south-west heading diagonally across the next field aiming for the far right corner where you emerge through a footpath gate onto a track. Turn left and follow this track through Redwell Wood and Hawkshead Wood heading south down the hill towards Blackhorse Lane. Just before reaching Blackhorse Lane you come to a small cottage on the left. 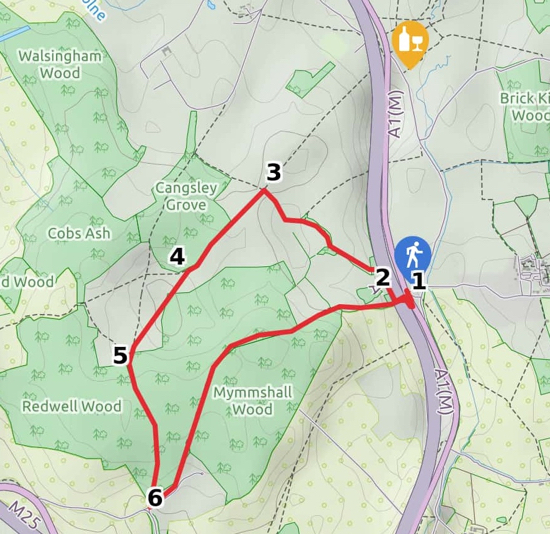 Immediately after the cottage, turn sharp left and head north-east up the track, over the hill, through Mymmshall Wood and down to the footbridge over the A1(M) where you cross and return to the starting point. Refreshments can be taken in nearby Water End at The Woodman Inn.